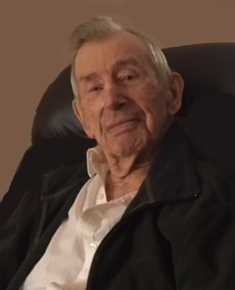 Obituary for Robert "Bud" Lynn Krueger | Throop Funeral Home, Inc.
Robert Lynn “Bud” Krueger, age 93, of Coopersville, formerly of Lake City, passed away at his home Monday, November 12, 2018. Bud was born in Armada, MI. to the late Herman and Lydia (Radloff) Krueger. He served in the Navy during WWII and operated a dairy farm in Lake City for many years. Bud enjoyed spending time with family and friends, was an avid euchre player and passionate gardener. He enjoyed sharing his vegetables with friends and neighbors who always looked forward to his sweet corn. Bud is survived by his wife of 71 years Jacqueline “Jackie” Krueger; children, Lynn Swart, Larry (Lori) Krueger and Robin Krueger; 5 grandchildren; 5 great grandchildren; sister, Phyllis Ellis and many nieces and nephews. In addition to his parents Bud was also preceded in death by an infant son, son-in-law Steve Swart, sisters and brothers-in-law Barbara (Robert) Townsend and Dorthea (Ken) Waun and brother-in-law Howard Ellis. In keeping with his wish cremation has taken place with a private interment service to be held at Coopersville Cemetery in the spring. The family suggest memorial donations in Bud’s memory be made to Grace Hospice, 3355 Eagle Park Dr NE, Grand Rapids, MI 49525.